On Wednesday, Chief of National Security Agency (NSA), General Keith Alexander defended US surveillance programs as part of a Noble Mission to protect the nation. He said that the collection of bulk phone records by U.S. Intelligence agencies are essential to preventing terrorist attacks. He referenced the criticism thrown at the intelligence services in late 2001 for not connecting the dots that led up to the Sept. 11 attacks. 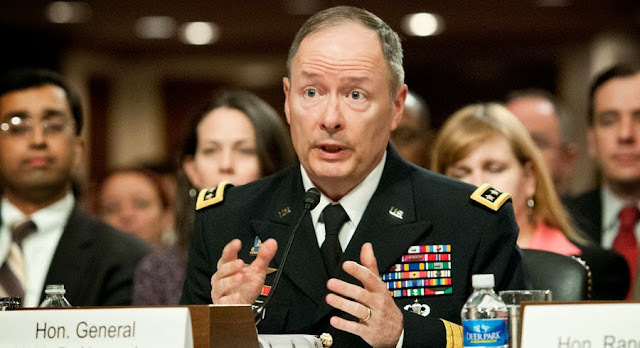 “We need our nation to understand why we need these tools, and what those tools mean for civil liberties and privacy and what they mean to defend this country,” General Keith Alexander said during a keynote speech at the Billington Cyber Security Summit in Washington. In recent months NSA has been targeted for severe criticism from privacy advocates, members of Congress and foreign allies of America, whose citizens may have been targets of this surveillance. Alexander pleaded for support of NSA programs during his speech at the conference, "This is not by accident. It's by a lot of hard work," he told. "Twenty-two cryptologists lost their lives in Iraq and Afghanistan. They're the heroes, not the (people behind) media leaks." Alexander did not mention Snowden by name, simply calling him "the leaker" adding that "we trusted him and he betrayed our trust. That won't happen again. That doesn't make him a hero." Alexander appealed to the public to support the surveillance effort, which is coming under scrutiny in Congress, and argued that the facts about the programs have been distorted. Alexander also defends the Tech companies like Google and Microsoft. He said that companies are not driving up to the NSA and dumping data. They’re doing what the courts are directing them to provide.